This is the same recipe as the previous bread that I made some weeks back. I replaced bacon bits with raisins..my all time favorite dried fruits. 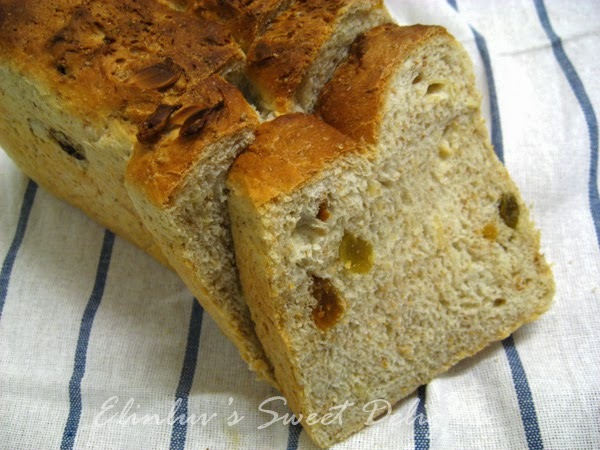 You can eat this as a stand alone bread without jam or butter. 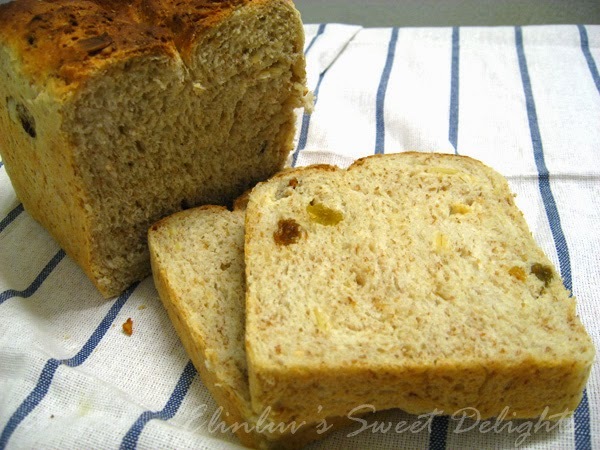 It taste even better if toasted :) Healthy loaf of bread. Love the texture and fiber packed and it is easy to make too. Put all the dry ingredients and salt in a cake mixer, using the dough hook , blend till mixture is properly combined, add milk, and water and continue machine knead till the dough clumps together, add butter till butter incorporates into the dough and the dough does not stick to the side of the mixing bowl. Take out and knead on a floured board , mixing in the raisins and almonds nibs till well combined. Leave in a warm place to proof till double in size (40 mins- 60 mins ). Knock down the dough and divide into two portion. Take a portion and roll out into a rectangular piece. Start rolling from the edge near to you and roll into log like rolling a swiss roll. Repeat the other portion. Leave the two rolls in a greased loaf pan and let it proof for another 30 - 40 mins till it has risen. Bake at 200 deg C for 35-40 mins or test it by knocking the bread , if it gives a hollow sound, it is ready to take out. Turn out the bread and cool on rack.